See all the Show Reports from 2018, most recent first. 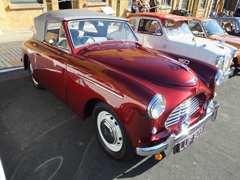 Our boutique classic vehicle show, at Newhaven Fort, concluded the SCS formal event calendar for 2018. With the Goodwood Revival competing for attention our show was still able to display sixty quality classic vehicles (see SCS photo gallery) and as we know quantity is not the true story !! 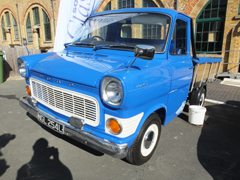 First to arrive was a superbly restored 1971 Ford Transit Mk1 Pick-Up owned by Micky O'Brien who in fact went on to win the Visitor's Choice "Pride of Ownership" and deservedly so. 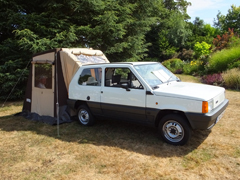 It is always a treat to see something different at classic vehicle shows and this certainly ticked the box with only eleven of these vehicles registered on the road; a nice touch was the photo restoration album showing the work undertaken. 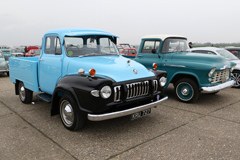 A handful of Autojumblers came along managing to sell items and with the doors of Newhaven Fort opening to the public at 10am, the classic car event proved to be an additional & enjoyable attraction for the visitors. Amongst our band of cars was a couple of well attended clubs, namely the Austin A30/A35, Morris Minor Owners Club and the MG Owners Club covering both Sussex counties. All-in-all a perfect event. The weather intimated dry with sunny intervals but in fact the day beamed with sunny rays throughout and for a September Sunday it was the perfect wrapping on a delightful show. 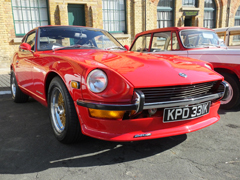 Congratulations to Terry Gosling with a 1972 Datsun 240Z and George Jeary presenting a 1952 Austin A40 Jensen Sport, for winning 2nd and 3rd "Pride of Ownership" awards respectively. SCS would like to say thank you and acknowledge our hosts Newhaven Fort, plus the volunteers who helped on the day to make the gathering run seamlessly Once again, my thanks to James Wright for taking the photographs, and to Richard Long for organising the show, and writing the report. Click here on this link for the gallery of photographs of the show. This show has always proved to be popular, being in a central location, and in the pleasant surroundings of the Worthing Rugby Club grounds. After all the recent bright sunny weather, the day dawned a bit overcast, but that didn't seem to damp peoples enthusiasm, and a steady stream of visitors made their way through the gates. Worthing is now the only show where we park the cars according to decade of manufacture, so that gave a different slant on proceedings. The oldest (pre-50s) cars were parked at the front - this row included a number of notable cars. 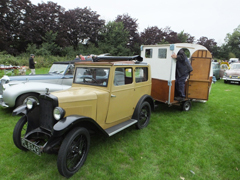 The vintage Morris Minor towing a folding caravan was certainly a sight worth seeing, as was the very rare 1927 Swift, with an incredible patina. The later decades included many marques worth a closer look. The cars covered a wide range from sporting cars, to family cars, and luxury cars. A car which ticked all those boxes was the lovely Jensen Interceptor. It's always interesting to see cars which were common in your youth, but which are now hardly ever seen - the immaculate Montego, for example. It was also good to see John's Gilbern out and about, too. 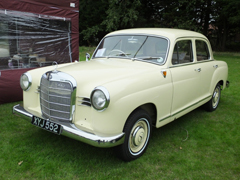 There was a big attendance of American vehicles, and these covered a wide range of types, from pickups, through large saloons, to sporting cars like the Corvettes. Also there were a variety of presentation styles, from the immaculate, to the more patinated. The Mercedes Benz Club had a "club corner" and provided an impressive array of classic Mercedes cars, from the 1960s to the 1990s. They received the award for "Best Club Stand". Winners and runners-up were awarded for each decade, and photos of the worthy recipients being presented with their trophies can be seen in the gallery. If you were one of them, well done, if not, better luck next time! With the amazing sunshine we have had in the past couple of months there was no doubt it would be dry and warm - what colour the grass was going to be was probably more of a question. As our charity show we were supporting the Kent, Surrey and Sussex Air Ambulance and The Alzheimer's Society so all profits were going to a good cause. We will let you know the final figure in a later Newsletter. Surprisingly the day started slowly with a steady trickle of cars, but then started to increase to be a constant stream of interesting cars. By the end of the day we had 145 cars through the gate and at 1pm had to close further entry after tucking cars into the little alcoves of trees and in any gap we could find. Many marques were represented including a Rolls Royce Silver Wraith, a FUN Fiat 500 with a bespoke convertible body, a number of large American cars, Jags from E-type to S-Type and some more modern, Stags, a lovely Mustard GT6, Spitfires, a Daimler Dart (with doggy passenger), several examples of Lotus, an SS Jaguar alongside of an impressive Bugatti Replica, BMWs, VWs (cars and campers) and of course a good coverage of tradition British motors with MG, Morris, Humber, Sunbeam, Hillman, two very nice Vauxhall Crestas - the list goes on. The best bet is to look at the Photos on the photogallery link below to see what you missed if you were not there. As is traditional at the Charity Show the top prize winner also wins the Brian Bennet Trophy, presented a number of years ago by Phyllis Bennet in memory of her late husband Brian who was a long serving club member, committee member and treasurer of the club. The trophy is engraved with the winners name and then held by them for a year. There was a lot of visitor voting and many cars got a mention but up until the end of voting the there were 5 cars vying for position - although the winner held a lead from early on. At the end three cars topped out and unusually the cars were all mature in their years, the youngster being 59! This is possibly a reflection of there being less children at this show who typically go for big, bright and chrome! 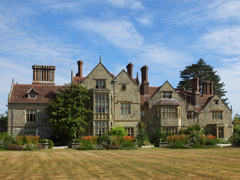 Many thanks to all who helped by volunteering, getting to the site early to setup (and again to take down), to the staff at Borde Hill and to the staff in the Garden Tea Rooms who admitted that it had been their busy day this year! Also, on a personal note, due to your webmaster's absence due to a clashing committment, my thanks to James Wright for taking the photographs, and to Phil Webb for writing the report. It's often said that our show reports feature some comments about the weather. When the weather is as nice as it was at Bentley, then why not? We were greeted by warm sunshine and blue skies, ideal weather to display our cars in this attractive setting. Clearly members and visitors alike agreeed with that view, as no fewer than 237 cars joined us, and the show field was full. 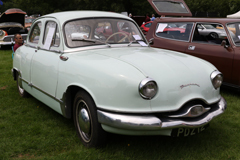 The cars on show reflected the range of eclectic and rare examples which is so characteristic of our shows. It's rare to see one of the original-type Lotus Elites on the road these days, but we had two, parked side-byside and gleaming in the sunshine. Another rare car was the Lancia Montecarlo, totally imaculate from front to back. Also, as usual with our shows, there were a number of American cars; the three Mustangs parked alongside each other, in red, white and blue colours were particularly eye-catching. 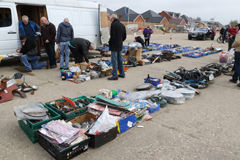 There was also a range of autojumble stalls, with their usual tempting goodies! 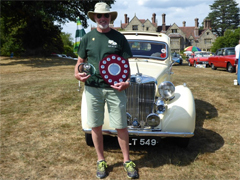 The prize for first place in the "Visitors' Choice" award went to the immaculate red E-type Jaguar - a worthy winner - well done to the owner, and also to the two runners-up (the second place Sunbeam and the third place Austin). The sunshine really brought out the car clubs, and we were pleased to see representatives of a wide range of clubs - the East Sussex MG Club, the West Sussex Region of the Jaguar Enthusiasts Club, the Panther Car Club, the Maestro & Montego Owners club, the East Sussex Morris Minor Club, the Austin A30/53 Club, and the Sussex Kit Car Club with a selection of their cars. On this occasion, the Maestro & Montego Owners club came out on top, with the award for "Best Car Club Stand". We'd like to thank the hard-working staff of the Bentley Tearooms, who kept visitors supplied with tea, food, and ice cream over the course of the day. They earned a highly commended award for their efforts. Finally, last but by no means least, we must finish with a huge thank you from the committee to all those volunteers who contributed and helped set up, run and tidy up after the show. All worked extremely hard to ensure that the show went well. Also thanks to Richard for organising the show. Thanks also, of course, to all the exhibitors who brought along their interesting cars, and all the visitors who came to see them. After rain the day before, the day of the show dawned fine and dry. This was our first show at this venue. 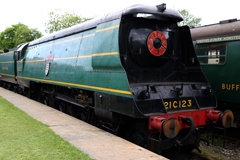 As well as offering a very pleasant display field, in a beautiful rural location, the adjoining Horsted Keynes station, and the Bluebell Line steam railway (with generous discounts on train travel, on the day) proved irresistable. 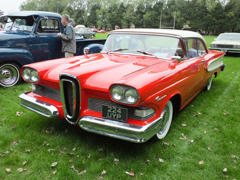 There was a steady stream of cars arriving from early in the morning, by 10:00am the field was already filling up, and the quality and variety was well up to Southern Classics usual standard. In total, over 200 cars joined us for the show, a good result for a new show. With such a variety to deal with, it's alwas difficult to single out one or two to mention in these reports. 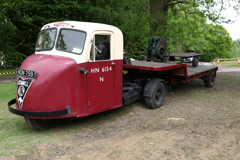 One vwhicle which certainly attracted attention was the 1957 Scammel Scarab "Mechanical Horse". It offered extreme manoeuvrability due to the ability to steer the front wheel through 360 degrees, and the ability to take a wide variety of trailers, and this made them popular with the railway companies. They could once be seen in large numbers around stations, and were also used by organisations like the military, but now they are a very rare sight. Also notable on a "cars with trailers" theme was the beautifully crafted special, with a trailer bearing a child-sized replica of itself! 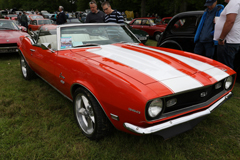 The prize for first place in the "Visitors' Choice" award went to the striking red and white Chevrolet Camaro - a very eye-catching car, and a worthy winner - well done to the owner, and also to the two runners-up. 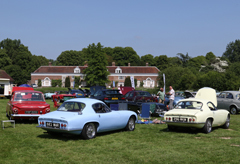 We were pleased to see representatives of both The West Sussex Region of the Jaguar Enthusiasts Club and the Sussex Kit Car Club with a selection of their cars. 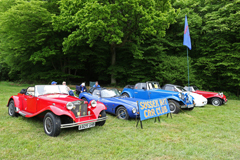 On this occasion, the Sussex Kit Car Club scooped the award for "Best Car Club Stand". Finally, last but by no means least, we must finish with a huge thank you from the committee to all those volunteers who contributed and helped set up, run and tidy up after the show, both from Southern Classics, and also from the Bluebell Railway. All worked extremely hard to ensure that the show went well. Thanks also, of course, to all the exhibitors who brought along their interesting cars, and all the visitors who came to see them. For the start of the Southern Classics Society show season for 2018, we returned to Tangmere Military Aviation Museum, and the vast concrete apron of the historic airfield. This offers plenty of space, and the proximity of the very interesting museum. Also the fact that it is all on hardstanding is welcome should the weather be poor. However the day started dry, and with a little hazy sunshine, and as usual there were soon a steady stream of cars at the gate as the "early birds" started to arrive. This continued through the morning, and the people manning the gate worked very hard to get them all into the show. In total, over 500 cars joined us for the show, a very pleasing result. It's very daunting to see the empty apron early in the morning, but the space soon filled up with our usual huge and varied selection of classics. There were 27 autojumblers too, (a record for one of our shows), with all kinds of goodies to tempt the attendees. 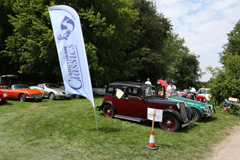 As usual with our shows, there was a very wide range of cars on show, spanning virtually the whole range of approaches to motoring over more than a century. 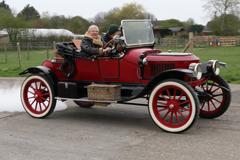 One aspect which caught the eye was the different motive power sources - from 1914 there was the Stanley Steam Car, a frequent and welcome visitor, which always catches the eye for it's smooth, silent, and surprisingly rapid progress. Then from more than a century later was the "modern classic" electric-powered Tesla Model X, which caused a stir by playing music and then opening & closing its doors in time to the music! It's always hard to select particular cars to write about when there are so many of interest. 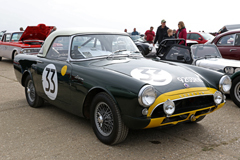 One particularly notable one was Justin Harrington's 1962 Ex-works LeMans 24hr Sunbeam Alpine, with it's specially-developed streamlined body. 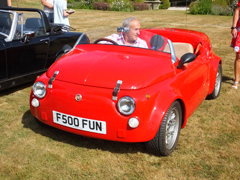 As usual, we were pleased to see representatives of other classic motor clubs in attendance. Local clubs like SADCASE and the Manhood Car Club for example. 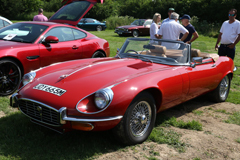 The West Sussex Region of the Jaguar Enthusiasts Club brought along an impressive selection of Jaguars, and there was also a group from the Independent Porsche Enthusiasts Club. The weather stayed dry for most of the day, light rain only arriving after the raffle. The record number of autojumblers and the refreshment stalls seemed to have plenty of customers. Finally, last but by no means least, we must finish with a huge thank you from the committee to all those that contributed and helped set up, run and tidy up after the show, both from Southern Classics, and also from Tangmere Museum. In particular a special thank-you to the additional volunteers who came forward in response to the appeals for help, from the committee. Your assistance was invaluable and much appreciated, and made the show run more smoothly. All worked extremely hard to ensure that the show went well. Thanks also, of course, to all the exhibitors who brought along their lovely cars, and all the visitors who came to see them.